The fourth entry in the series of tower defense strategy games Kingdom Rush. The players are taken to a fantasy realm filled with magic, monsters, and knights. Kingdom Rush Vengeance is the fourth entry in the very popular series of tower defense strategy games started in 2011 by Ironhide Game Studio from Uruguay. The game was announced in January 2017, but it debuted on market many months later. 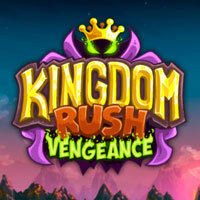 Kingdom Rush Vengeance takes place in a fantasy realm full of magic, weird creatures, unusual beasts, and brave knights. A conflict between the forces of good and evil takes place here for many years. The forces of darkness have been defeated many times, but the reckoning day has come. The powerful Vez’nan has returned and this time the player will join his side. The gameplay principles in Kingdom Rush Vengeance are similar to principles of previous entries in the series. The players must stop the attacks of hostile warriors by placing defense buildings, casting spells, and sending soldiers with special skills. What distinguishes the fourth entry in the series from previous games is the fact that this time the conflict is presented from the side of the evil. This means that the players gain access to spells that are more fitting for the dark army. The same goes for units – the players can use warriors that they previously fought, for example, orcs. The levels in Kingdom Rush Vengeance are very varied – they include ice deserts and lively forests. Each map has a unique character thanks to the colorful, stylized graphics. The music in the game is nice to hear.